Hillsboro’s Ethan Watson (12) drives baseline against Fairfield’s Conner Priest and Indians’ forward Reece Bloomfield clears the Lions’ Ethan Saunders out of the lane Tuesday at Fairfield High School where the teams competed in a cross-county rivalry varsity boys basketball game. 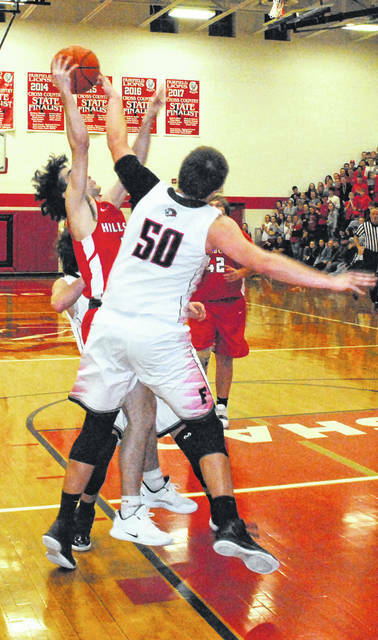 Fairfield’s James Bentley (50) blocks Hillsboro’s Luke Magulac as he attempts a layup on Tuesday inside Grandle Gymnasium at Fairfield High School. 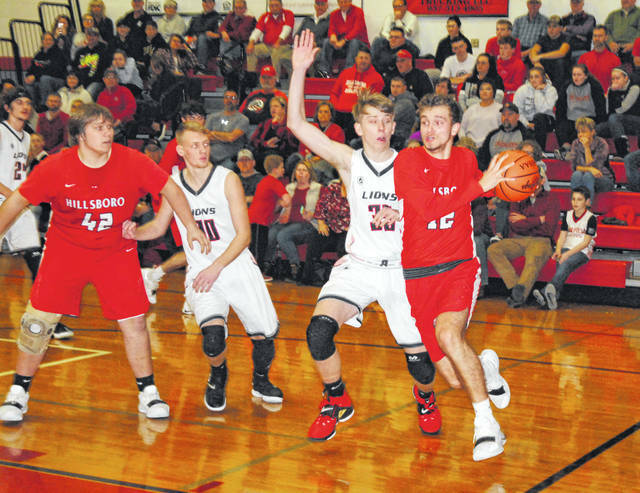 LEESBURG — The Hillsboro Indians traveled to Fairfield High School on Tuesday to take on the Fairfield Lions inside of a packed Grandle Gymnasium and took home a resounding 64-43 victory in which Hillsboro never trailed. Hillsboro started the game strong defensively and limited the Lions to just four points over the first five and a half minutes of play while putting up 10 points of their own including a three pointer by Ethan Watson to make it 10-4. Wyatt Willey answered with a three pointer for Fairfield to get the Lions within three points at 10-7 but, Hillsboro finished the quarter with a 6-2 run and took a 16-9 lead into the second quarter. Hillsboro continued to apply the pressure against Fairfield in the second and scored six straight points to open the quarter including two steals and fast break layups by Ryan Scott that extended the Indians’ lead to 22-9 and forced the Lions to call timeout with 5:43 to play in the half. Following the timeout Fairfield outscored the Indians 11-10 over the final 5:43 as James Bentley had three points and Sam Buddlemeyer had four to lead the way for the Lions. The damage had already been done by the Indians and they took a comfortable 32-20 lead into the halftime locker room behind a stout defensive effort and balanced scoring that saw Mason Swayne, Gavin Temple, Ryan Scott and Ethan Watson tally six points apiece while Brad Miller had eight points the team. Buddlemeyer tallied six points in the third quarter for the Lions but was the only Fairfield player to score in the period as the Indians continued to apply pressure and force turnovers. Hillsboro recorded the first six points of the third as Swayne, Scott and Miller each recorded a basket for the Indians and pushed their lead to 38-20 early in the frame. The Lions held serve with the Indians for the remainder of the quarter and Hillsboro took a 44-26 lead into the fourth. Fairfield finally found their groove offensively in the fourth quarter as they scored 17 points in the deciding period but were unable to get closer than 16 points. Hillsboro tallied 20 in the fourth quarter including two big three pointers by Temple that helped to extend the lead beyond the reach of the Lions with nearly four minutes still to play in the game. Hillsboro and Fairfield will both be back in action on Friday on their home courts. Hillsboro will host the Jackson Ironmen in Frontier Athletic Conference play and Fairfield will welcome the Lynchburg-Clay Mustangs to Grandle Gymnasium in a cross-county and Southern Hills Athletic Conference matchup.